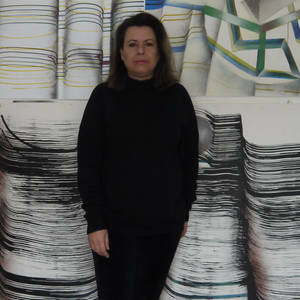 www.isabelacastelan.com / I am originally from Florianopolis, Brazil and I now live and work in London. I travel regularly between both countries to keep in touch with my native culture which plays an important part in my work. London is a significant place for me to spend time in the studio developing work and an exiting place to be immersed in contemporary art culture and of course, the chance to taking part in exhibitions. My work is primarily based on automatism of the psyche. Automatism refers to the performance of actions without conscious thought or premeditation, especially through the use of mechanical techniques or subconscious associations. I use a process of gestural automatism to explore spaces that reflect an inner-landscape. This is a simple process but only possible with a sensitivity to working in the moment and achieving a space of contemplation in which to make the work. To achieve this, I make my own drawing and painting tools; accessories that can create multiple lines that overlap and undulate. These tools act to enable or disable the possibilities of the body to explore spaces that are extensions (or corruptions) of the body and the mind. In this sense, the paintings and drawings can be seen as the result of a performative activity. Sometimes, I work more directly with performance which is recorded photographically. These works are records of small improvised performances composed between myself and my surroundings and documented intimately by myself. The images often have a symbolic function or meaning for me, that is related to my personal and cultural history. In Brazil, we have a strong spiritualist tradition that comes out of our mixed background, cultural traditions and African heritage. This informs my approach to the mythical stories and collective memories and spiritual aspects of my Brazilian heritage which are an important part of my creative identity. 2001 - 2003 MA Painting, Slade School of Art, UCL, London.UK. 1995 -1998 BA Fine Art Painting, Chelsea School of Art & Design. London, UK. 2018 Chaiya Art Awards, gallery@oxo, London. The Fronteer Open, Sheffield. 2017 Codes of Faith, Laura Gallery, London. Electric Picture House, Cheshire. CAF 17, Chester. Small Faces, Solent University, South Hampton. 2014 London Calling. The Truman Brewery - Dray Walk Gallery, London. Share and Exchange - Zap Gallery, London. 2013 Zap Summer Show - Zap Gallery, London. 2011 Taken Away, Pop Up Gallery. Wooble And Squint, Exmouth Market, London. 2010 Iris, a maquina do tempo, fund. Simposio, Brazil. Paintings, UFSC, Brazil. Black and White Paintings at Green Park, London. 2007 The Sky from my Garden, London. Paintings Brighton, Uk. Abstract Painters@hands Sallon, London. 2006 Life and its Obcessions, London. First Brazilian Film Festival, 298 Gallery, London. 2005 My Tools, Wagdas, London. Corpus, Wagdas , London. 2004 Childer's St. Open Studios, London. 2003 Hang the curator, The Central Space, Faroe Road, London. Nth Art Exhibit 001, Ols & Co Gallery, London,. Kinectca, Mont Pelier, London. Slade School of art MA Show. 2002 Four Colleges Exhbition at Kearney, Berkley Sq, London. 2002, Paintings in the park, Woburn Sq. , London. Slade School of Art Summer Show. 1998 Chelsea College of Art Degree Show. Chelsea College of art And design in Germany. 2009 IDFX Magazine, Issue 129, 07/09. 2008 Design at all, 11/ 08. 1998 University of the Arts, London.